"Oh Crumbs" is based in Thornton, by Glenrothes Fife. 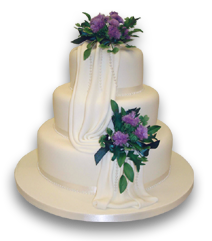 Janet, your Sugarcraft expert, previous college lecturer and winner of 13 Salon Culinaire medals, has over 20 years experience in Wedding cake design. She loves a challenge and is always ready to discuss, develop and design, any ideas the bride brings to her, about how she wishes her 'dream' cake to look on her special day. On show, is a range of traditional, contemporary modern, to funky, novelty and the exotic cakes, with all sugar flowers, figures, top tier pieces and much more, handcrafted to the brides specifications, perhaps complimenting the bridal bouquet, wedding dress design, colour schemes and themes. Janet believes, that to her, every cake is a competition piece and dedicates all her expertise to achieve this end. We dare you to be Different.